Nitrates such as nitroglycerine and isosorbide mononitrate are unique drugs, and at least in theory ideal for treating Isolated Systolic Hypertension in the Elderly (ISHE). Early wave reflection from aortic stiffening increases late systolic pressure in the ascending aorta and left ventricle, and is the cause of ISHE, but diastolic pressure and mean pressure are normal. Nitrates decrease or abolish wave reflection from peripheral arterioles, “trapping” this within the peripheral arterial networks (Yaginuma et al. Cardiovasc Res 20:153–160, 1986). While having the most favourable of all mechanisms for treatment of angina pectoris and ISHE, nitrates have disadvantages over conventional modern anti-anginal and antihypertensive drugs, and so are usually used in conjunction with other drugs. The purpose of this chapter is to describe the actions of nitrates, the properties that make them useful, and those which can detract from their use in clinical medicine. 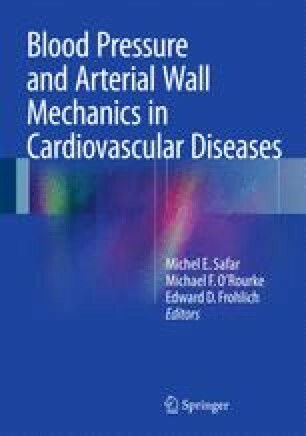 All have been clarified by modern concepts of aortic elasticity, arteriolar resistance, wave reflection, and pressure pulse wave analysis. Surprisingly, few if any of the mechanistic concepts are considered in contemporary journals and textbooks. Vane JR. Adventures and excursions in bioassay: the stepping stones to prostacyclin. 1982. www.nobelprize.org/nobel_prizes/medicine/laureates/1982/vane-lecture.html. Furchgott RF. Endothelium-derived relaxing factor: discovery, early studies, and identification as nitric oxide. 1998. www.nobelprize.org/nobel_prizes/medicine/laureates/1998/furchgott-lecture.html. Ignarro LJ. Nitric oxide: a unique endogenous signaling molecule in vascular biology. 1998. www.nobelprize.org/nobel_prizes/medicine/laureates/1998/ignarro-lecture.html. Murad F. Discovery of some of the biological effects of nitric oxide and its role in cell signaling. 1998. www.nobelprize.org/nobel_prizes/medicine/laureates/1998/murad-lecture.html.